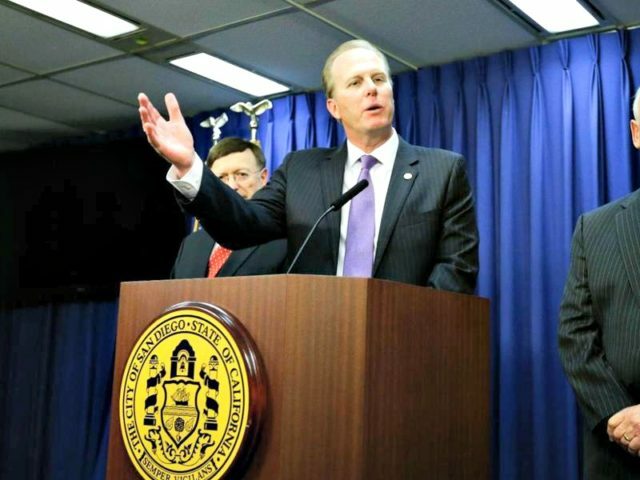 San Diego Mayor Kevin Faulconer won the over 50 percent needed this week to avoid a November runoff election and score his first non-special election win. Faulconer was the only registered Republican in the technically non-partisan race for the position of mayor of one of America’s eighth-largest city. He won 58.53 percent of the vote in Tuesday’s election with 100 percent of precincts reporting. He beat out former Democrat and former Assemblywoman Lori Saldana who ran as an Independent and won 22.2 percent of the vote. Bringing up the rear, registered Democrat and former San Diego City Councilman Ed Harris pulled in just 19.27 percent of the vote. Political consultant John Hoy told local 10 News that Faulconer is likely to benefit from his work on “more traditional Democrat issues” when it comes to working with the City Council. Faulconer was a City Councilman himself for eight years before assuming office as Mayor. Lifeguard union chief Harris was appointed to replace Faulconer on the City Council. Based on the City Charter he was precluded from running for the position in the subsequent election. San Diego voter registration as of May 23, 2016 was comprised of: 36.89 percent Democratic Party, 32.29 percent Republican Party, 25.93 percent No Party Preference and 4.88 percent other party affiliation. Faulconer first won election to the position of mayor in a 2014 special election to replace disgraced Democrat Mayor Bob Filner. A former long-time Congressman, Filner came under intense scrutiny for a litany of sexual harassment charges that eventually resulted in a payment of at least hundreds of thousands of dollars to claimants and forced Filner from office. In one case he pleaded guilty to false imprisonment and misdemeanor battery. A San Diego reporter later admitted that many in the media had known about sexual harassment accusations against Democrat Filner for years and never looked into or reported on them before his election as mayor. The Atlantic reported that Filner had been the city’s first Democrat elected as mayor in two decades.